The popular Spring Hotel Bitacora Tenerife is a top quality 4 star hotel, situated in the heart of Playa de las Americas and only a short stroll from the best shopping and entertainment areas, three minutes from the beach and you can even walk to the nearest 18-hole golf course, Golf Las Americas only 1 kilometre away. 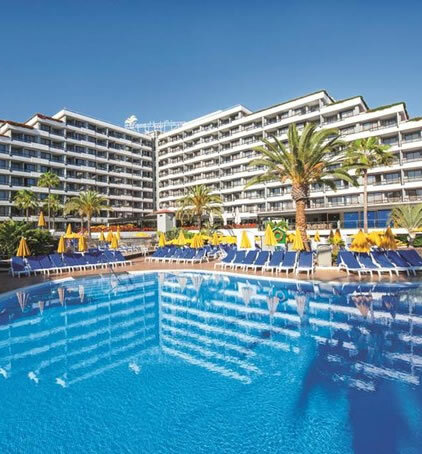 A great choice for a family holiday this hotel has been a favourite with UK holiday makers for several years and has a huge list of returning guests. 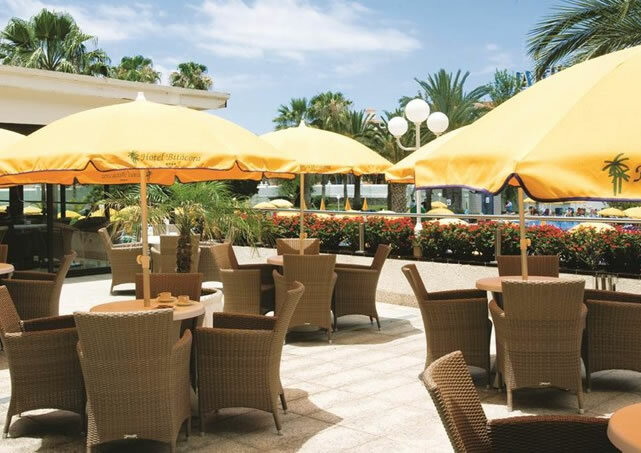 Along with its sister hotel the Vulcano hotel they are both rated very highly amongst 4 star hotels in Playa de las Americas. The island's climate and the hotel's facilities make the Bitacora a good option for a summer or winter holiday. The rooms in the Bitacora are spacious and can comfortably accommodate up to 3 adults and 1 child up to 10 years, or 2 adults and 2 children up to10 years. 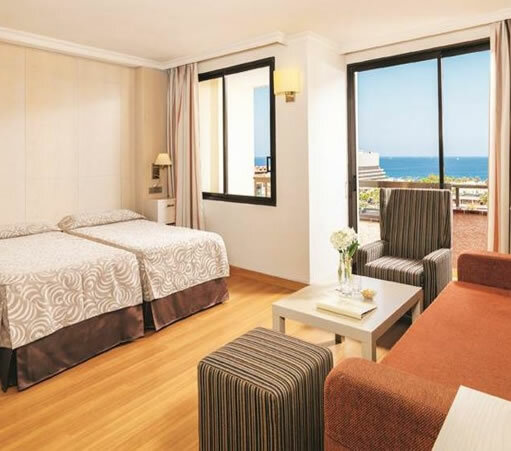 There are two room types in the hotel, the standard rooms and the superior rooms, standard rooms include, mini-bar, hairdryer, air conditioning, satellite TV, terrace or balcony and the superior rooms include, mini-bar, hairdryer, air conditioning, satellite TV, terrace or balcony. There are also the following extras in all the pool view rooms (former superior): free safe, bath robe, pool towels, wine and dried fruit on arrival. 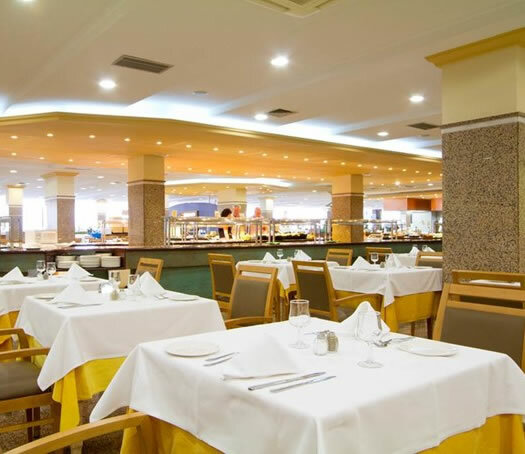 The main restaurant is the venue for buffet service for breakfast, lunch and dinner as well as choices from the Show Cooking Grill, which is greatly appreciated by the hotel's guests. During the day the poolside "La Palapa" Snack bar offers the choice of lunch time snacks or à la carte meals for you to enjoy. Please note the hotel does have a dress code for gentlemen at dinner time (long trousers and shirts with sleeves and closed shoes). The hotel also has spacious lounges and two bars. 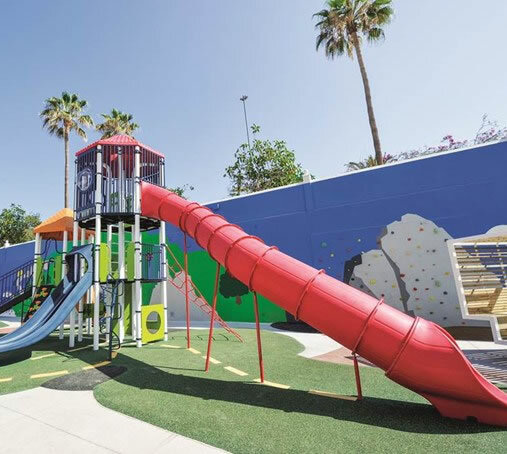 The Bitacora Playa de las Americas has a wide variety of holiday amenities including, two big swimming pools (one which has a children's section and a water slide), dedicated "Nenelandia" children's playground, mini golf, French Bowls, a tennis court. You can just relax or have lot of fun without leaving the hotel, for those that want to join in there's a lively entertainment programme with games and different activities in the day time and international shows and dancing to live music in the evening. The hotel has a 24 hour reception, foreign exchange facilities, free Wi-Fi connection in public areas (such as reception), The Eugeni Evsikov clinic is situated in the hotel, the Energetic cure massage was started by Eugeni Evsikov in 1997 in Germany and came to Tenerife in 2002. This method is based on an old Russian healing methods, the Chinese ying-yang system, osteopathy, soft chiropractic, head and face acupressure and seeds and herbal treatment.